Hadley Termite & Pest Control, Inc.
To the left is a picture of our technician's fingers holding a piece of termite tube. He removed the section he is holding 24 hours prior to the photograph. The darkened section of the termite tunnel is where termites have repaired their pathway with dirt and saliva. This was a fairly new house, under 3 years old. The termite protection on this house failed. (No, we did not do the initial services on this home.) 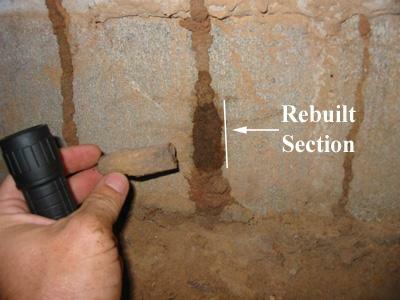 The following pictures detail the amount of termite activity under this particular house. This house is on piers, so the termites had to work a bit harder for their meal, could you imagine how much worse the damage would have been, had this home been built on slab? Even if your home has metal walls, your home is still vulnerable to termite attack. Most homes have stud walls (made of wood), sheetrock (also made of cellulose materials), possibly wood floors, and certainly wooden furniture all of which are sources of a termite's favorite snack - wood. Chemical termite treatments are the most effective way of limiting termite activity around your home. Did you know that most home owner's insurance policies do not cover termite damage? It is by far cheaper to have your home treated for termites and keep up your yearly renewals than to pay for the repair costs of damaged studs and support in your home. Don't gamble. Protect what is yours - with a termite treatment from Hadley!